Stranded aka Djinns (2010): Desert Deja Vu? That this French film made little to no impact on the world of cinema is evident by the overwhelming lack of information on the internet. Both IMDb and Wikipedia have very short ‘blurbs’ on the film apart from a shorthand version of the story/plot and a cast list. I can’t really understand why. It is a decent enough film in a small niche market of military horror. Yes, it has been done before and arguably better. The South Koreans with the brilliant (and in my humble opinion the best of the lot) R-Point in 2004 followed closely by the 2008 film The Guard Post. Not only has Korea created this cross-genre but by making two military-horror films one after the other seems to prove that they have mastered this niche genre. The UK brought out Deathwatch in 2002 and Stranded reminded me of the film with the choice of colours and the muted desert tones that pervade the film. A not too dissimilar plotline and cast of characters made the film seem a bit like a distant cousin to Deathwatch. Written and directed by Hugues Martin, and Sandra Martin, Stranded is the maiden voyage for the both of them and they acquit themselves well. The actors were mostly unknown to me as I am not a huge French film fan. I did recognise Cyril Raffaelli who is perhaps better known as a stuntman and stunt coordinator. 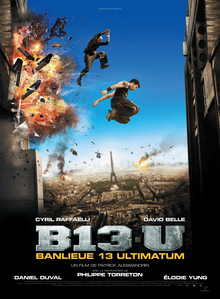 He played the lead role in Luc Besson’s excellent District 13 and the sequel District 13: Ultimatum (Cyril was the stunt choreographer for both films) and he was a ‘baddy’ in Die Hard 4.0. The film opens with a lone figure in a military uniform staggering down a highway surrounded by desert. The figure is carrying an aluminium briefcase with a handcuff on it. At one point he fires his weapon, an SMG, wildly and then collapses. He is rescued by more French military personnel and they begin to question him about the briefcase and where the rest of his squad is. One week before the survivor along with the rest of his squad were sent out into the desert to find an airplane that had crashed and to look for any passengers who might still be alive. The squad have all been together for a while except for the newest member who was recently drafted into the military. This newcomer is Michel (Grégoire Leprince-Ringuet) and he has brought along a spring operated cine camera to film their desert search for the missing plane. Once the squad have found the plane, they find all the bodies bar two and an aluminium briefcase that has been handcuffed to one of the passengers. Vacard (Thierry Frémont) hacks the dead man’s hand off to take possession of the case. Thierry plays Vacard with a mix of cold professionalism with just a hint (at first) of homicidal madness that really makes him stand out in the film. After the men have collected the corpses from the plane Michel arranges his comrades around the area and he starts directing and filming them. Just as he gets started one of the men is shot and the remaining squad members take cover and begin returning fire. Vacard kills one of the attackers and the men take advantage of this to escape the plane and head off into the desert. A sandstorm blows in and slows down their escape and hinders the attackers from following them easily. While they have camped for the night during the storm Ballant (Emmanuel Bonami) appears to be approached by some almost invisible creature. Michel witnesses this and he watches as Ballant tries to steal the briefcase and after failing he wanders off into the storm. While the squad are looking for Ballant the stumble across a village. The men enter the village and round-up all the occupants accidentally killing a girl in the process. Since the film was originally titled Djinns it is no real surprise when these desert creatures start taking over and influencing the dwindling number of French soldiers. The film was atmospheric, moody and slightly eerie. The actors all did a good job and there was a plot twist at the end. So really I don’t get why it was so poorly received. I felt it was entertaining, if not too original, but to be fair there were only a few military-horror films that came out prior to this film’s release. I would recommend seeing it just because it does entertain well. It got a little confusing at one point, but that’s because I stopped reading the subtitles while I answered an email or two. It did not spoil the film, however, and I soon picked the loose plot thread back up. It is currently on show via LOVEFILM in the UK and I’m sure it wouldn’t be too hard to find in a film rental shop. My final verdict is that despite the initial poor reception, it’s definitely worth a watch. Even if you don’t get to see Cyril Raffaelli do any smooth parkour moves. Author Mike's Film TalkPosted on October 17, 2012 Categories Film ReviewsTags Arts, Cinema of France, Cyril Raffaelli, District 13: Ultimatum, Djinn, editing, Film Review, Grégoire Leprince-Ringuet, Guard Post, Internet Movie Database, Movies, Stranded, Thierry Frémont4 Comments on Stranded aka Djinns (2010): Desert Deja Vu?